There are many church management software solutions on the market, to say the least. It can be overwhelming for churches to find an offering that fits their style, needs, and budget. From time to time we focus on some of the lesser known and start-up software companies because they’re often newer to the market and have a fresh approach to church management software (ChMS). While the five companies listed below are not all “new,” many of them are “newer” in that they were launched less than five years ago and serve churches of different sizes and scope from church plant to mega, from US to international. Easy Church Tools began as a sermon podcasting company in 2006 and grew to introduce church giving software in 2010. In early 2012, they launched their latest product: Connect Manage, its web-based church management software offering. Connect Manage offers simple tools to import, connect, report, track attendance, and manage all kinds of stats of your church including: Total number of people, totals for adults, children, and families. Plus the percentage of people active in ministries and small groups. Their software also offers important dates features that remind church staff of birthdays, anniversaries, weddings, and graduation dates for each member in your church. Easy Church Software’s church management tools are designed for small to medium sized churches. Larger churches usually will have greater needs for their church management software. They don’t claim to have every feature, but do focus on important things as well as adding features to meet the specific needs of churches they work with. Their Connection Step system will help churches keep track of new visitors through a customizable and welcoming process and also allows churches to keep track of new visitors and make sure they are connected into the church. The profile data that can be added can integrate with Facebook, Twitter, or other social networks too. This helps churches keep in contact with people using methods other than just email or phone. Connect Manage pricing is low and offers phone and email support with every account. Easy Church Tools are compatible with smartphones and tablets and offer additional features to make church easy. To find out more visit Easy Church Tools. ChurchDesk is a software as a service (SaaS) platform to help churches manage their workflow easier and faster while reaching out to their congregation more effectively. Their tools are closely integrated to deliver value by allowing the church to do their work smarter and ensure only one point of entry and more collaboration among staff and volunteers. This includes closely integrated tools for both internal and external communication. Church Desk is market leading in Europe with customers in many countries.Church Desk software scales from small to large churches in rural areas as well as cities. The user interface is built to deliver value instantly and ensure easy onboarding for people without IT skills.Features include people, resource, and event management with possibilities of syncing with mobile devices, reporting and personalized dashboard. The intranet allows the staff to collaborate easily and increase transparency among their users. The homepage is fully integrated and minimizes data maintenance by automatically synchronizing with public data in the calendar, user database, signups, etc.To find out more visit Church Desk. SimpleChurchCRM’s philosophy is to offer web-based church management software in a way that is simple, straightforward, and created for non-technical users. Created four years ago, SimpleChurchCRM got its start by working with local churches and they continue to do so now. Practically, the software streamlines features like child check-in, group texting, and online giving. They offer robust mobile apps for leaders and child check in volunteers that offer practical features for any size of church. SimpleChurchCRM works with churches of all sizes. They work with many church plants and smaller churches who enjoy their mobile apps and their easy-to-use iPad child check in app. Tracking follow ups is important for churches of all sizes, so our interactions feature provides a way to involve staff and leaders in visitor and member follow ups, without requiring them to log in to SimpleChurch. For medium and large churches, their integrations with Mail Chimp, Constant Contact, and Planning Center Online are popular. Their mass contact tool allows churches to mass email, text, and voicemail groups in order to stay connected effectively with members and visitors. SimpleChurchCRM also offers an integrated online giving system with industry-leading low rates, text-giving, mobile giving, and kiosk giving. Information is kept in one place, where the appropriate pastors and leaders can access important information, anywhere. Attendance is easier, since small group leaders can take attendance on their smart phone. Child care volunteers can even SMS text message a parent of a child during a worship service via our native child check in app for iPhone. SimpleChurchCRM’s mobile apps allow leaders to take attendance, record and assign ministry visits / calls, send mass emails / texts / voicemails to groups, and add visitors. Parents can even check in their child on their iPhone as they walk onto campus, before reaching the check in station. To find out more visit SimpleChurchCRM. Breeze is a web-based church management solution specifically targeted towards meeting the needs of small to mid-sized churches (those with an average weekend attendance of between 50 – 1,000). Most small and mid-sized churches don’t have the time or resources for lengthy training or complex instructions. Breeze strives to serve churches by providing a clean, intuitive, and easy-to-use interface combined with personal and responsive customer support, all at a price that won’t break the bank for small and mid-sized churches. Features of Breeze ChMS include automated notifications when people stop attending or giving, group administrative and communication tools, children’s check in and event reporting, contribution tracking and reporting, QuickBooks integration, email and text messaging, MailChimp Integration, member access, online giving, and much more. To find out more visit Breeze ChMS. Elvanto’s approach to the ChMS market is about creating a product that’s really user friendly and inclusive. There’s no add-ons and everything is included in the subscription. One of the biggest benefits to using Elvanto is that everything is really scalable, since all features are included in the package (many ChMs either do rostering or database management, or offer add-ons). Elvanto did this in the hopes that the same benefits are offered to churches of all sizes. The company serves a variety of church including church plants composed of a few leaders all the way up to churches with members 10,000 and over. – They have servers across Australia, Europe and the USA, which deals with a lot of privacy concerns churches face today. -Mobile access to the information they need anywhere. Their system fully supports smart phone and tablet use. To find out more visit Elvanto. Lastly, one of the most helpful church software review websites is Capterra, which lists many more church software offerings along with links to their sites and reviews from actual users. What church management software does your church use and how is it working (or not working) for your church? You stated the list is in alphabetical order, but it isn’t. So, is there any significance to the ordering? Hey Traye! Good catch! Looks like my team edited this article recently and (whoops) the alphabetical order got jumbled. So you are correct–the list is in no particular order. 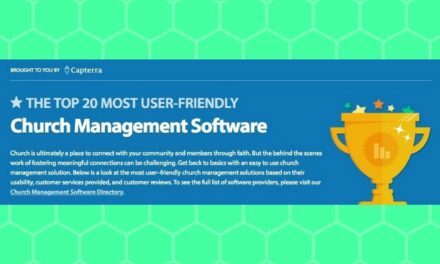 Another great site to review and look up Church management software is http://www.capterra.com/church-management-software/ – they list lots of reviews and also go over features to help churches know what they are getting. I highly recommend them! I’m looking for an SEO expert to interview on my podcast. Are you available or can you email me some suggestions? Thanks! Hey Bryan! Sorry I didn’t reply to your interview request. I don’t think I’d consider myself an SEO expert. I’m a pro blogger, writer, and church tech “expert” if you want to call me that. Happy to help where I can. Shoot me an email at lauren at churchtechtoday dot com. Thanks Lauren for sharing, after reading this article I registered for 30 days free trail with 1st company easy church tool and enjoying my free trail. Till date I recommend it and thanks again for sharing. How’s the free trial going, Stella? Which software did you try out? Chip, I’ve been checking out Seraphim, great product! It seems that a lot of Chms companies are offering their own in house online giving software as part of their software package. Does Seraphim offer one?